We are entering into a time period when economic growth may be lower than we are accustomed to, the likelihood of recessions may increase, and income will continue to be very unequally distributed. Our response to these problems, which depends upon who wins the presidential election and which party controls the House and Senate, will play a critical role in determining how well our economy performs, who benefits from economic growth, and how we respond if the economy enters into a recession. The following graph illustrates some of the challenges we face. The red line shows the rate of economic growth since 1953, the blue line shows population growth and the shaded areas show time periods when the economy was in a recession. The difference between the red and blue lines is a rough measure of the growth rate in our standard of living. For example, when GDP is growing faster than the population is growing (i.e. the red line is above the blue line), as it does most of the time, our standard of living is rising. Notice that, on average, the growth in our standard of living has been much lower in the post-recession time period than in the past. If this continues, it will create several problems. First, it will be much more difficult to overcome rising inequality and all of the political turmoil that comes with it. Second, the time periods when economic growth falls below population growth do a remarkably good job of identifying recessions (the only time period when this happens that is not officially identified as a recession is the small blip of the red line below the blue line in the mid-1950s). 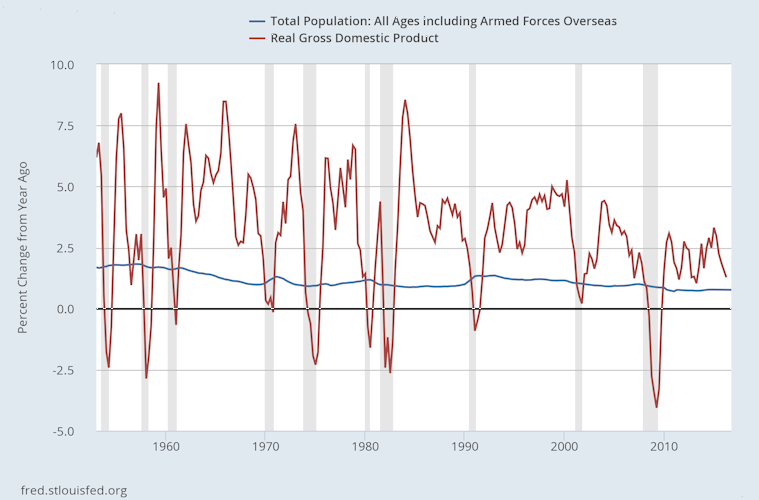 If we assume the size and frequency of economic shocks in the future won’t change much relative to recent decades, which seems reasonable, then the chances that economic growth will fall below population growth – i.e. the chance of a recession – is higher than it used to be. Third, lower economic growth means lower growth in tax revenues and a deterioration in the government’s budget outlook. That will result in pressure to either cut government spending, raise taxes, or some combination of both. To address these challenges we will need policies to increase economic growth and the growth in our standard of living, and social insurance programs to blunt the impact of recessions and distribute economic risks equitably. It will also be important to have monetary and fiscal policy authorities who are ready and able to implement effective policy responses to an economic downturn. Related: Global Debt Hits a Record $152 Trillion. Is That as Scary as It Sounds? In addition, if the inequality problem does not fix itself (a proposition I see as unlikely), policies will be needed to ensure the gains from economic growth are broadly and fairly distributed across income classes. And we shouldn’t forget the need for effective regulatory policy to reduce the chance of another financial panic, promote competition, and protect consumers. The solutions to these problems offered by Republicans and Democrats are very different both in the types of policies they would pursue and the probability of success. For Donald Trump and Republicans, the solution to slow economic growth is always the same, cut taxes on the wealthy and reduce regulation. That hasn’t worked in the past, and there’s no reason to believe this time would be any different. To make it worse, Trump’s tax cuts would increase the national debt by trillions. That makes it very likely that social insurance programs Republicans have had in their sites for decades, programs that reduce the costs of recessions for the working class, help to ensure an adequate retirement and provide access to health care, would come under pressure. A significant increase in the national debt also makes it likely that fiscal policy, which would be needed in a deep recession, would be unavailable. Finally, Trump has not demonstrated much knowledge of monetary policy so he would probably rely upon advisors when appointing the Fed chair and members of the Federal Reserve Board. The result would almost surely be a Fed that is much less likely to take aggressive action in a recession or financial panic, and less supportive of financial regulation. Hillary Clinton and Democrats would pursue policies that, in my opinion, have a much better chance of increasing economic growth, provide more protection against economic risks faced by working households, and move us toward a more equitable society. For example, instead of tax giveaways to the wealthy that have failed in the past, Clinton and the Democrats favor policies that directly encourage technological innovation, the ultimate source of improvements in our standard of living. Clinton has also made it clear that she will protect and try to improve social insurance programs such as Social Security, Medicare, food stamps, unemployment compensation, and Obamacare, and that she will do her best to help working families in other ways such as reducing child care costs. Her programs do not increase the national debt, they are paid for in part by shifting the tax burden to the wealthy – a step towards reducing inequality – and she understands the important role that fiscal policy can play in deep recessions. Finally, I have confidence that her appointments to the Fed would provide us with the monetary and regulatory policy that we need. It is unlikely that Democrats will control both the House and the Senate if Clinton wins, but it is very likely that Republicans would control both if Trump wins. So the choice we have is between electing someone – Clinton – who would implement policies with a reasonable chance of raising economic growth, use the threat of a veto to protect the social insurance programs that we have, and perhaps make incremental improvements in areas such as protection for working families, the distribution of taxes, and regulatory policy. Or we can elect Donald Trump and return to the tax cuts for the wealthy and deregulation policies that failed in the past – policies that will put pressure on social insurance programs, make it harder to fight severe recessions, and increase inequality. For me the choice is clear. University of Oregon macroeconomist Mark Thoma writes primarily about monetary policy its effect on the economy. He has also worked on political business cycle models. Thoma blogs daily at Economist’s View.